Hypoglycaemia is one of the many challenges people with diabetes encounter, with some patients experiencing multiple episodes of hypoglycaemia on a regular basis. 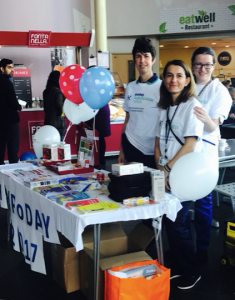 The aim of Hypo Awareness Week was to give the public and healthcare professionals knowledge regarding signs and symptoms of hypoglycaemia and how to treat hypoglycaemia. All of the Adult Diabetes Inpatient Specialist team got involved in the help of setting up and managing the stands. The stands were decorated with posters and balloons for more visibility. Diabetes companies provided posters, booklets, leaflets, hypo treatments and blood glucose monitors for the diabetes team to give to members of the public. The diabetes reps also helped manage the stand and were one with the team to disseminate information about hypoglycaemia. The stands provided information suitable for the public, people with diabetes and healthcare professionals who provide care for patients with diabetes. Hypo Awareness Week was a great opportunity to disseminate information regarding recent changes made by the Trust’s hypoglycaemia protocol. The main change was the replacement of Lucozade (due to sugar tax) with gluco juice. The Trust’s standardised red ‘hypo boxes’ now include gluco-juice in a 60ml bottle. The updated list and contents of the hypo boxes were part of the information disseminated. OUH also updated its Management of Hypoglycaemia guidelines. The biggest piece of information that the team focused on in disseminating was the implementation of the updated OUH Hypo-STAR guidelines which is now a major part of their Hypoglycaemia Guidelines. As a result of NaDIA 2016 and the local audit, it was evident that OUH healthcare professionals are great at seeing and treating hypoglycaemia. However, re-assessing and recognising (why the hypo occurred) needed improvement. An audit was done in summer 2017 on the trust’s EPR Diabetes Alert and Trigger system. This system sends alerts and trigger messages in EPR for any results indicating severe hypoglycaemia in the areas. This is constantly checked by the diabetes team which then allows proactive action to support the areas without waiting for a referral from the ward. Healthcare professionals were given information and copies of the hypo star and new guidelines to take to their wards. Hypo-STAR stickies were also given to staff to use to stick onto the patient’s folder when he/she experiences hypoglycaemia. This provided visual prompts for others to know of the episode. The OUH diabetes team are intending to review this in six months time and look for any improvement the Hypo-STAR guide had brought to the care and management of hypoglycaemia in the Trust. Many of the public were not aware of what hypoglycaemia was or why it occurs. They did know the seriousness of this condition. Many healthcare professionals asked a lot of questions about the most effective way to treat hypoglycaemia and how they can help prevent their patients from developing hypoglycaemia. People with diabetes were given literature regarding driving, exercise, diet, exercise, alcohol and blood glucose monitoring. The diabetes reps (i.e. Accu-Chek) supplied blood glucose meters which were very popular for people with diabetes – many people had seen this meter for the first time. All age ranges appeared to appreciate the glucose meter. Some people’s comments were that they ‘were excited to use this new device’.